Large northern pike sometimes eat small ducks and mammals. Northern pike have an elongated body and head, a broad, flat snout shaped somewhat like a duck bill. The jaws, roof of the mouth, tongue, and gillrakers are armed with many sharp teeth which are constantly replaced. A single soft-rayed dorsal (back) fin is located far back on the body. Northern pike can be variable in color: a fish from a clear stream or lake will usually be light green, while a pike from a dark slough or river will be considerably darker. Males and females are similar in appearance but females live longer and attain greater size. Fish up to 9 kilograms (~20 pounds) are common in some Alaskan rivers and lakes, though Northern pike can grow much larger. The state sport fishing record is a 17-kilogram (~38 pound) fish caught on the Innoko River, a tributary of the Yukon River. 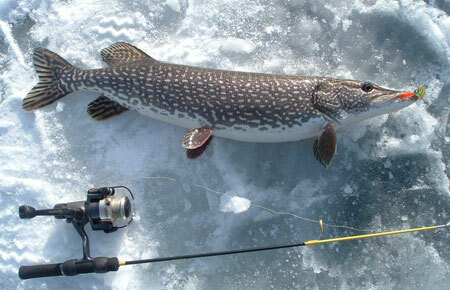 Northern pike spawn in the spring of the year soon after the ice goes out. An 11-kilogram (~25 pound) female may contain up to 500,000 eggs which she deposits in the grassy margins of a lake shore, slow-moving stream, or slough. The eggs drop to the bottom where they stick to grass, rocks, or other debris. Because of the cold temperature of Alaskan waters, incubation may take 30 days. Because ice-covered, shallow lakes become depleted of oxygen, most Northern pike overwinter in the deep, slow waters of large rivers. Spring migration from overwintering areas to spawning grounds and then to summer feeding areas are generally short distances. Movement during the summer is localized between warm, shallow feeding areas. 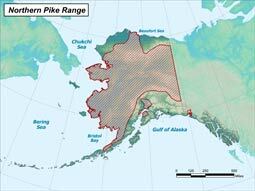 In Interior Alaska, a 308 millimeter (12-inch) pike may be two to three years old. A 635 millimeter (25-inch), 2.5 kilogram (~5 pounds) pike may be six to eight years old. Fish 7 kilograms (~15 pounds) or more, may be 10 to 17 years of age. Young northern pike feed on small crustaceans and insects. By the time they reach 50 millimeters (2 inches) in length they may be eating smaller fish. Adult northern pike eat other fishes (mostly whitefishes but also suckers, burbot, smaller northern pike and juvenile salmon). Large adults can eat voles, shrews, red squirrels, and small waterfowl. A bald eagle chick, was found in the stomach of one large female. Northern pike range from the Alaska’s Interior to the Arctic coast, from the Canadian border to the Seward Peninsula, and southwest to the Bristol Bay drainages. There is a small, isolated population near Yakutat. During recent years, illegally-stocked northern pike have established themselves in streams of the Susitna River drainage south of the Alaska Range as well as on the Kenai Peninsula. The vast majority of northern pike fisheries in Alaska are well off of the road system and far from human settlements. These remote populations are considered stable. In some fisheries where northern pike are easily accessible, reduction in the size composition as well as localized depletion of abundance can occur. There are only a handful of populations of naturally-occurring northern pike that are subject to overfishing, with most of these being in the interior (e.g., Harding and Volkmar lakes). Northern pike are considered invasive in some parts of the state. In Alaska, the vast majority of northern pike populations appear healthy with most fisheries being sustainable. Where development and northern pike coexist, threats such as oil and gas development, agriculture, and timber harvest may impact the local populations. Recently, it was discovered that bioaccumulation levels of mercury by large predatory fishes (such as northern pike, burbot, Arctic grayling, and Pacific halibut) in some parts of northern and western Alaska may be high enough that eating large quantities can be harmful. However, the data is limited and research is ongoing. The Alaska Division of Public Health (DPH) is working with the U.S. Fish and Wildlife Service (USFWS) to learn more about mercury levels in northern pike, so that we can provide advice to Alaskans about how much is safe to eat. Length to 4 feet, weight to 40 lbs.